Keep your drums sounding their best! Complies with California “VOC” air quality and all safety regulatory requirements. This is a nontoxic product that is less harmful than methanol alcohol. Many elements come together in a drum set: cymbals; percussion; drumheads; sticks; and hardware. These varied components are put under a lot of stress by the high-impact nature of drumming. However, in terms of products to care for and optimize the sound of their instruments, drummers have been largely underserved – until now. PROcussionCare® WearBarrier is a conditioning formula for drumheads (both acoustic and electronic mesh), rims, and sticks that prevents excess wear and maximizes sound quality. The formula’s unprecedented conditioning technology removes embedded dirt and grime for better-drumhead-to-bearing-edge contact, creating an enhanced sweet spot, the central area of the drumhead with the most desirable tone. Overall sound is improved, heads and sticks last longer, and tuning becomes easier and more accurate. Putting ProcussionCare® WearBarrier in your gig bag ensures your drums will always sound and look their best under the demands of heavy touring. Three sizes are ideal for use in the shop, on the road, or in the studio. Also available with ProcussionCare® CymbalCare and PedalLube in a three-pack for a total drum maintenance package. Formulated especially for the unique and punishing demands of drums and percussion, PROcussionCare® WearBarrier is the result of research into micro-lubricants for demanding ballistics applications. An astounding ability to penetrate and lift away deeply embedded grime and tiny debris particles ensures that your drum’s vibration and response is unrestricted. A micro-thin barrier lubricant coating remains after treatment to resist sticking impacts, promote enhanced tone, and allow increased stick rebound. Recommended application is with a soft lint-free cloth. Product quickly dries to the touch for immediate use. Available in three sizes for rehearsal room, sound studio, or touring. No More Black Oxidation Mess on Cymbals and Drums! Music repair and rental shops, through interaction with drummers and percussionists, are all too familiar with oxidation – it’s the process that causes messy black build-up on cymbals, quickly covering the cymbal surface with black marks that are then transferred to drumheads and drums. These small oxidation deposits grow to eventually restrict the full vibration of cymbals and drums, and will eventually lead to destructive corrosion. PROcussionCare® WearBarrier is a new product engineered to prevent the formation of black oxidation while also conditioning and cleaning drumhead surfaces of dirt, debris, extraneous marks and fingerprints. 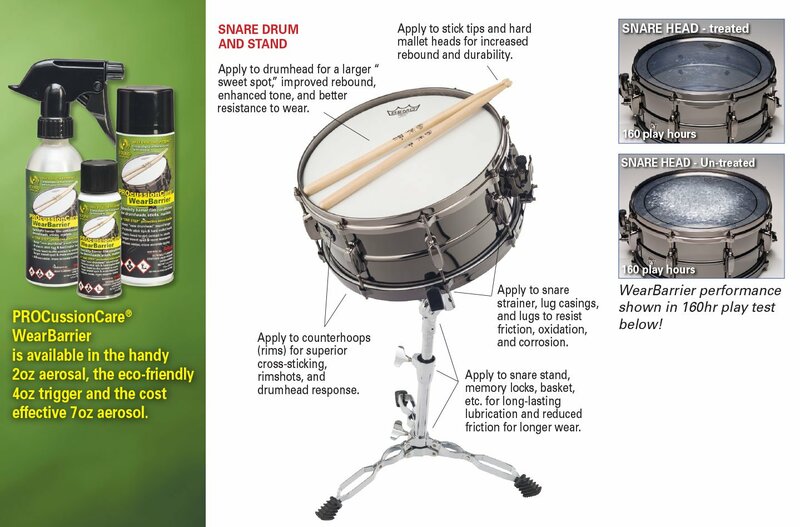 CymbalCare’s non-toxic formula is made for use on drumheads (acoustic & electronic) stick tips, and hard mallet heads. Silicone– and teflon–free. The proprietary formulation is the culmination of years of research and development in flex-film technologies, and has been a cornerstone of private label products since 1986. Sound Synergies aerosol products come standard with wide-angle spray cap and 5-inch extension straw for hard to reach areas. Our adjustable trigger sprayers are constructed of durable high-impact plastic and spun aluminum bottles. All rubber plugs and gaskets are made from rugged, long lasting Viton® (fluorocarbon rubber) which has excellent resistance to high temperatures, ozone, oxygen, mineral oil, synthetic hydraulic fluids, fuels, aromatics and many organic solvents and chemicals. Click here for liquid trigger sprayer assembly instructions.